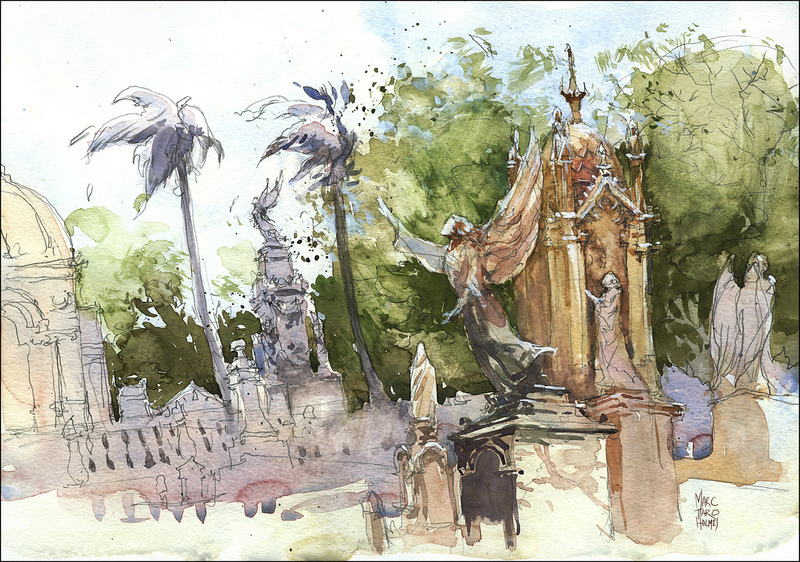 So we’re back from a few weeks of drawing in Havana. This was our second trip. The city remains a fascinating portrait of dystopia. It’s exuberant, ornate, ultimately over-reaching glory, now in slow motion collapse. Once home to imperialists, pirates, gangsters, and revolutionaries – and the people they ruled, robbed and re-educated. Testament that nothing lasts forever. It’s hard not to become philosophical wandering through a city of once-opulent structures, crumbling before your eyes. People are clearly working to turn things around, but everywhere you look is erosion and faded glory. I’m glad we went back so quickly (it’s only been a year). You can see changes everywhere. Eventually all the decay might be cleaned up – but what we see in a few years might only be a faint hearted replacement, sanitized for the tourists. I’ve brought back a fat stack of sketches from the streets. I’m very excited about the work ahead. We have great plans for the paintings I’m hoping will come from the location drawings. Though I normally show work as fast as I make it – this time I’m going to keep it under my hat for a few months. I’ll be working on scaling up the drawings, and executing some studio work based on the research. Not to worry though. It’s turning spring here in Montreal – so I’ll be posting some work from the home-turf soon! I think Cuba (particularly Havana) is one of those destinations that will be unrecognisable in a few years. I’m determined to get there asap but flights are steep from my part of the world. Hope you were suitably inspired on your trip! o.m.g. there must be so much to draw in Ireland. Can’t wait to make it over there! But yes. Strange and lovely and ugly place Havana. Will be interesting to see if it becomes like America, or America like it. Can’t wait to see your upcoming paintings…love your work!!!! Another wonderful painting. My nephew just got back from Cuba and remarked how it looked like time stood still. I would like to know how you control your paint. Do you use mask-it or do you pre-wet your background only? I’m still hoping you make some instructional courses. Keep them coming! Your work is always inspiring!